This dual-fan low profile cooler gives excellent cooling with minimal noise, thanks especially to its thermally-controlled PWM fans. The NH-L12 is a low-profile quiet cooler designed for use in small form factor cases and HTPC environments. With its flexible NF-F12 (120mm) / NF-B9 (92mm) dual PWM fan setup, the NH-L12 can be configured either for full performance in dual fan mode or extra-low profile (66mm) with the top fan removed. Bundled with the award-winning NT-H1 thermal compound and Noctua's SecuFirm2 multi-socket mounting system, the NH-L12 packs everything a premium quality quiet cooler needs into a highly compact package. The NH-L12 can be used with the NF-B9 92mm fan only in order to reduce the overall height to 66mm. This way, the cooler is suitable for many typical ATX or Mini-ITX enclosures and ideal for whisper-quiet HTPC systems. The NH-L12s NF-F12 and NF-B9 fans support PWM for convenient automatic speed control. In addition, the maximum fan speed can be reduced to 1200/1300rpm using the supplied Low-Noise Adaptors for even quieter operation. Noctua's enthusiast grade SecuFirm2 multi-socket mounting provides broad socket compatibility (LGA 2011, LGA2066, LGA1366, LGA1156, LGA1155, LGA775, AM2, AM2+, AM3, AM3+, FM1) and meets the highest demands in safety, performance and ease-of-use. Some Intel based Mini-ITX mainboards don't allow for the installation of backplates. 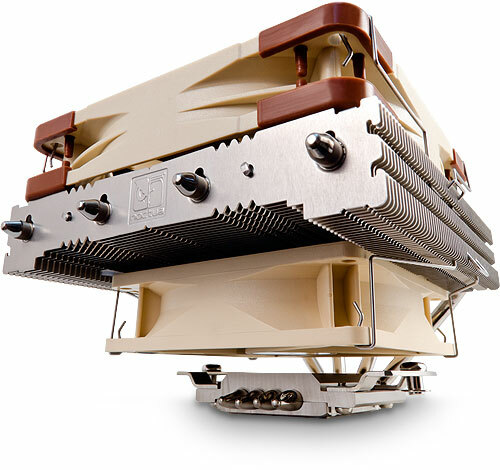 The NH-L12 thus comes with an extra set of Intel mounting bolts which make it possible to install the cooler without using the SecuFirm2 backplate. Caution: The NH-L12 is a low-profile quiet cooler designed for use in small form factor cases and HTPC environments. While it provides first rate performance in its class, it is not suitable for overclocking and should be used with care on CPUs with more than 95W TDP (Thermal Design Power).